Komedia.co.uk Bath Opening Times, Tickets booking and Promo Code: Located at 22 – 23 Westgate Street, Bath, BA1 1EP in Bath city, UK, Komedia is a live entertainment venue which presents comedy and live entertainment. Every week it features comedy from three top stand-up comics followed by Motorcity on Saturday which is a fusion of Motown, Soul, and Funk. Komedia has won many accolades to its credit; it has won the Chortle Comedy award for Best venue in the West for five times, the Soil Association GOLD Food award for Life catering mark, West Gold award for Art Café for serving finest local seasonal food made from organic ingredients. 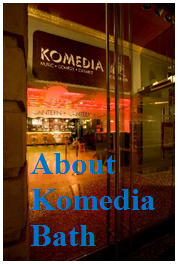 Usually, Komedia opens 2 hours before the show start time where food is to be served; mostly it opens at 6.30pm. For shows where food is not to be served, it opens before 30 minutes before show start time. This is general information and can change, specifically in case of music events. You can book tickets online anytime a day at www.komedia.co.uk/bath. You also can book tickets buy by calling Box Office at 0845 293 8480 between Monday-Saturday from 10am to 4pm. Tickets can be purchased in person at the box office too. For online booking, booking fee of £1.00 per ticket is charged; whereas for booking through phone, 1.50 charges are added per ticket. There is no booking fee for in-person booking. For a group of 8 or more, group discount is available. No seats are reserved, you have to reach to the venue and secure your seat. Talking is not allowed while performers are going on the stage; you will be asked to leave if you spoil the enjoyment of others. You can also buy Komedia gift vouchers and give it to your friends or families. Gift voucher is valid for 12 months and it is to be presented towards making payment. You can get Komedia Bath promo code and avail discount. There are several third party websites which offers promo code and you can get up to 60% discount. The promo code is to be applied before you make payment.